TORONTO, March 1, 2018 – Canadian Orebodies Inc. (the “Company”) (TSX Venture: CORE) is pleased to announce results from the Company’s fall 2017 Black Raven prospecting program and the discovery of multiple high grade gold bearing vein structures that represent a significant new discovery in the Hemlo camp. Initial prospecting and sampling carried out on the Black Raven Project uncovered new gold bearing veins either in outcrop or sub-cropping that are spatially associated with a N110E trending structural corridor bounded by two regional shear zones: the Beggs Lake and Fallen Lake Faults (see attached figures). Discovery of high grade quartz sub-cropping float over a 50 square metre area near Roccian Lake containing 2-3% pyrite, +/- galena and locally fine specks of visible gold which assayed up to 109.0 gpt Au. Host rocks were highly silicified tonalite, of the Beggs Lake Stock, that typically displayed weak to moderate quartz-carbonate alteration. A series of flat lying, en-echelon quartz veins also hosted by the Beggs Lake Stock, located 300 metres southwest of the above high grade samples. Assays returned results of up to 11.6 gpt Au. This occurrence consists of narrow, stacked ~30 degree dipping quartz veins containing 1-4% pyrite within hematized tonalite of the Beggs Lake Stock. To date the vein system has been traced over a 60 metre strike length. Numerous, low grade (maximum 1.3 gpt Au), north to northeast trending quartz tourmaline vein/vein systems near the northern contact of the Beggs Lake Stock were discovered. Tourmaline occurs as disseminations, blebs to semi-massive to massive aggregates within the vein systems and wallrock. The Tibia (Lucky Lake) Occurrence where quartz veins, containing 1-2% pyrite, +/- chalcopyrite, galena assayed up to 14.7 gpt Au. 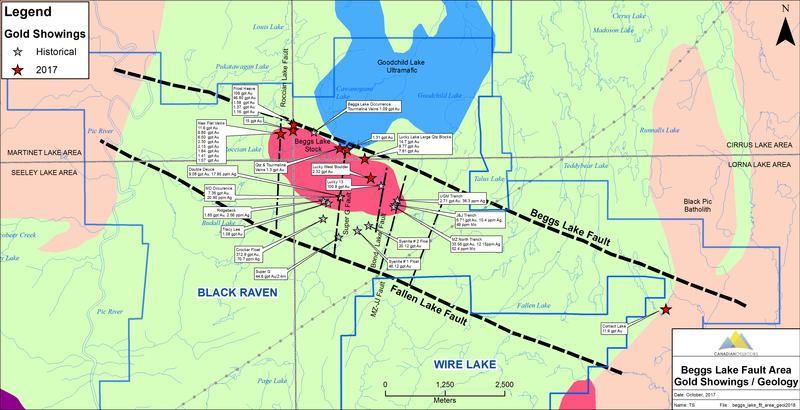 The Lucky Lake Occurrence is located approximately 1,800 metres east southeast along the mineralized corridor from the ABC and Gold Shore discoveries near Roccian Lake. 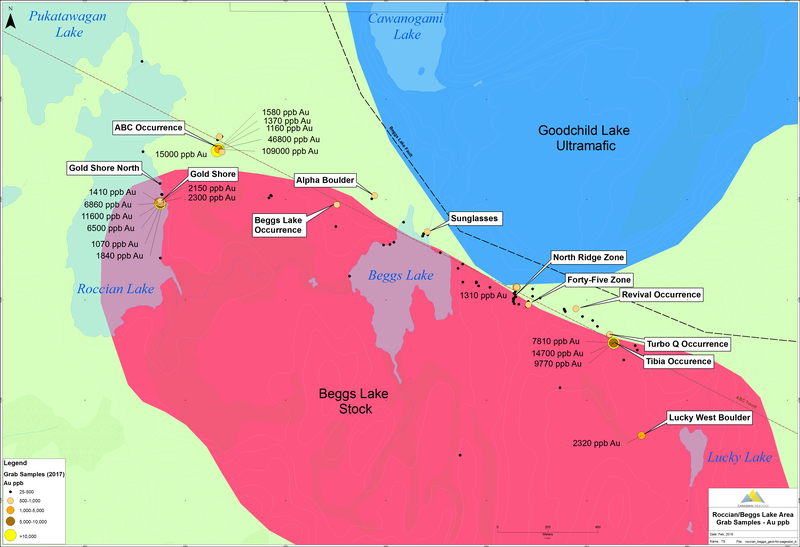 The Contact Lake Prospect is located approximately 8 kilometres east southeast of Roccian Lake along trend near the contact zone between supracrustal rocks of the Hemlo greenstone belt and the Black Pic Batholith. The occurrence is poorly understood as only one day of reconnaissance prospecting was carried out in the area. North to northeast trending veins were noted along a creek bed within a mafic body in the batholith that contained trace to 1% pyrite/chalcopyrite and galena. Grab sampling results included assayed up to 11.9 gpt Au. Bruce MacLachlan, Canadian Orebodies’ Prospector stated, “Beginning at Beggs Lake in July 2017, prospecting partner Coleman Robertson and I started to recognize significant silicification, pyrite, and quartz ± tourmaline veining in outcrops and boulders, including what appeared to be extensional, flat-lying gold bearing quartz veins, at numerous locations near the northern and western contact of the Beggs Lake Stock,” Bruce MacLachlan further stated, “My career began in Hemlo during the summer of 1983 for Noranda Exploration where for 18 years we carried out exploration programs in the region including north of Marathon. Based on my experience and intimate knowledge of the Hemlo Camp, I believe that the highly anomalous gold values and altered rocks located during the 2017 field season suggest that Orebodies may be on the verge of a new gold discovery in the highly prolific Hemlo Greenstone Belt”. As these assay results were received late in the season, only a limited amount of follow-up prospecting could be carried out before closing the exploration camp for the winter. Of significance is that the gold bearing structure has now been traced for over 8 kilometres and has produced a significant amount of notable showings including 109.0 gpt Au, 46.8 gpt Au, 15.0 gpt Au, 14.7 gpt Au, 11.9 gpt, Au, 11.6 gpt Au, 9.7 gpt Au and 7.8 gpt Au over an 8 kilometre strike length*. A total of 651 samples were collected along the trend, with an overall average of 0.467 gpt Au (uncapped), and 11 samples grading greater than 5.0 gpt Au. The structure remains open along strike to the east and west. The Company plans to commence a detailed exploration program in 2018 which will include two airborne surveys commencing as soon as weather permits, followed by extensive prospecting, mapping and sampling that will lead into a drilling program. Further details regarding the 2018 program will be made available in the near term. * Readers are cautioned that grab samples are selective by nature. The grades and mineralization present are unlikely to represent future average grades on the property.